Skew rolling machine is the special equipment which applies the Spiral groove skew rolling forming process to manufacture milling steel ball, bearing ball blanks and other metal ball. This skew rolling mill applies the semi closing frame so it is easy to change the roller. The skew rolling mill have the complete adjusting function;The rigidity of machine base is good; The manufactured products have the high accuracy. The whole machine includes major motor, speed reducer, universal-joint spindle and the working main machine. The skew rolling forming process is a new technology to produce the rotary parts or blanks. It can be used to manufacture the milling steel ball, bearing ball, auto part and other products. 3. Improve quality and the working condition and so on. Steel Ball Skew Rolling Machine is specially designed for the grinding steel balls of different materials such as medium carbon steel, alloy steel etc, which is widely used in the field of mines, gold, copper, bauxite, iron ore, aluminum ore, nonferrous non-ferrous metal ore, metallurgical and mining, cement, thermal power, flue gas desulfurization, magnetic materials, coal water mixture, pellets, superfine powder, slag, fly ash, calcium carbonate, quartz sand etc industries grinding ball or rod miller etc. Equipped with conveyor system and heating furnace, can realize mechanization and automation production. Automatic steel ball skew rolling line without human intervention, automatic production, make sure the stability of the steel ball quality. This line production process contribute to environmental protection, saving energy but high efficiency. Steel balls have precision dimension, good roundness, high hardness and good mechanical properties and high impact toughness, strong crushing ability etc characteristics. 1. Main body is with good rigidity. 3. Locking is solid, high stability. 4. Easy to change guide plate. 5. Production is compete automation, high production efficiency, large output. 6. Low energy consumption, no pollution. 1, Automatic control the quenching temperature, make sure the quenching quality. 2, Automatic roll fast rewind function, make sure the rollers be not damaged. 3, Automatic feeding function, improve the material utilization. 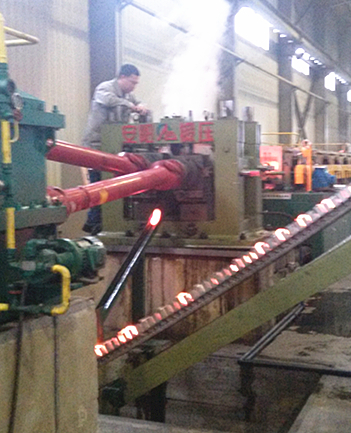 Anyang design the steel ball hot rolling production line is fully automatic production line, upto the latest levels of hot-rolled steel ball production. Anyang design and manufacture series steel ball hot rolling production line, including ZQ20, ZQ30, ZQ40, ZQ50, ZQ60, ZQ70, ZQ80, ZQ100, ZQ120 etc complete size of steel balls miller lines, can produce φ 20 ~ 120mm different size steel balls. 5,High performance price ratio, cost saving is obvious.